So often, the simpler recipes are the best, and this one – containing just ten ingredients. Knorr Tomato Pronto makes this recipe quick and easy as Pronto is already cooked before going into the can. 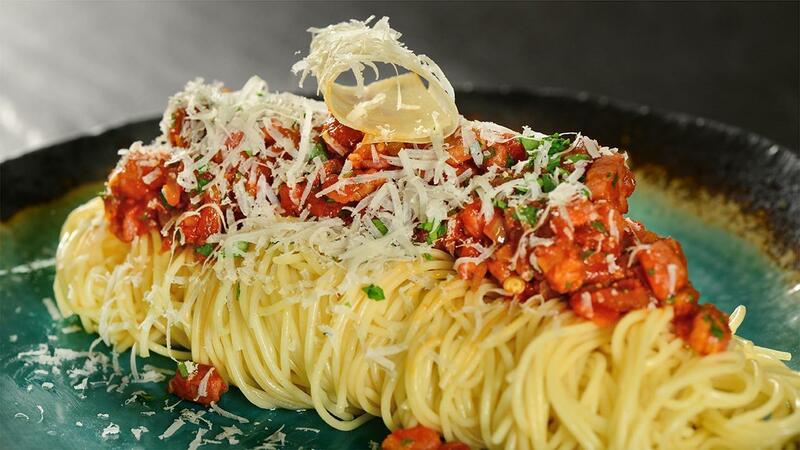 Originating from Italy, it’s made with Bucatini – which is kind of like fat spaghetti with a hole running through the center. You can make the dish with spaghetti, angle hair or even penne or rigatoni if you prefer, but bucatini is the best. Heat the oil in a large frying pan and add the bacon, cooking on a high heat until just crisp, stirring in thechilli flakes for the last minute of cooking. Remove the bacon mixture from the pan and add the onions to the oil that has been left in the pan. Cook the onions on a low heat for 5 minutes, until soft. Add in the Knorr Tomato Pronto and Basil Pesto bring to the boil, and then simmer for 10 minutes, stirring occasionally until thickened. Cook your pasta at this point too. I cook my pasta in boiling water to Al dente stage, so that it still retains a bite of bite, then drain, reserving half a cup of the pasta water. Once the pasta is cooked and the tomatoes are thickened, add the pasta to the pan with the tomatoes. Add three-quarters of the parmesan, the cooked bacon mixture and the black pepper, then toss everything together to coat the pasta. Add in some of pasta water if the sauce is a little too dry for you (although the sauce should stick to the pasta, without pooling at the bottom of the pan). Serve topped with the reserved parmesan and parsley. For a vegetarian twist use brown mushroom instead of Bacon.